I got my steer back from the meat shop today; this is the one that I wrote about in this blog post. The truck that hit it can be seen in this blog post. That's what 450lbs of boneless meat looks like, all cut and wrapped. It takes up about 12 cubic feet of freezer space. This is a pretty good illustration of what a farmers table fare is, though. My thanksgiving turkey is the one that has one eye. My spring lamb is the one that played chicken with the tractor wheel - and lost. My chicken is the one that never really got to full sized. I tell myself they're cornish game hens... and they are, just not intentionally so. Roadkill. It's what for dinner! Previous picture. Looks like it's settled 2" or so. Click on the pics for a bigger version. Pig farming is pretty difficult with respect to veterinary bills. It's impossible to get a pig treated and then sell it at market price and make a profit of any sort, but I sure do hate to see them die young or have to put them down. This little female (the grey and white one at center) has an unbilical hernia. It's a hole in her abdominal wall that didn't close up, and part of her guts -- probably her intestines -- are protruding out of her abdomen and pushing against the skin of her belly. This is considered to be a genetic defect, and usually means that she'll be raised as a strictly slaughter animal, but the real issue is keeping her alive. I spotted this hernia a week ago and used a livestock crayon to mark her so that I could find her in a group of piglets, and I watched this hernia to see what it was going to do. The skin covering it is getting bruised and has a scab on it, and the little girl is showing signs of being in pain, which means we've come to a decision point. Either she gets treated or we put her down. In this case, the hernia isn't very big, and she's still very young and pretty healthy, so we'll try treating. It's not obvious, but small hernias like this are actually more dangerous to the pig than a big one. The risk is that a small piece of intestine will get into the hole and then get pinched off or broken, causing the rapid death of the pig. A bigger hernia means a smaller chance of something getting entrapped. So small is one reason I'll treat her right now. Here's the tools we'll use. Half a tennis ball and a roll of duct tape. Cost? About $5. First, gently restrain the pig and carefully and gently push the material back into her abdomen. there's a bit of pressure back, and the skin on top is pretty sore, so slow, patient and gentle is the key here. Then using half the tennis ball, push it into the hernia. The tennis ball will provide support for the abdominal wall while healing takes place. The theory is that the hole will close itself it it's not being held open by the intestines intruding into it. It's that constaint straining that is causing this pig pain, and preventing weight gain like her littermates. It helps to have someone give you a hand here. After the first wrap of duct tape goes on we hold her by all 4 legs, and do a couple more wraps around the middle. And here she is after the procedure. She's not really happy about the tape, but I watch her to make sure she's moving and eating and drinking, and I also move her into a pen with just a couple of buddies. Eventually the other pigs will chew off the duct tape, but it'll take a couple of weeks. I'll watch to make sure that she's pooping and that her belly doesn't swell from retained waste. And the next day she's out moving around with the other pigs, and moving more easily. We'll see if she gets through this. My survival rate using this technique is about 80%. Without any treatment about 30% of them spontaneously get better, and then other 70% die in the next month or two. With this particular pig she was not gaining weight and showing signs pain and distress, and it was time to intervene. Put the cows out on their summer pasture today; they'll be there until probably October or so. Grass looks good, fences walked and they're in good shape. I purchased this land at an auction in 2008, and built a corral on it in July of 2009. Because I want to be able to easily load and unload animals there, a permanent corral was a pretty important amenity. It's turned out to be very handy; when I buy new cows, having a hard-fenced area that I can hold them for a few days while they get used to the situation is nice. The corral needed a load of gravel to the gate; after the flood last year the ground was pretty soft, so moving the loaded stock trailer in was a bit of a chore. 10 yards of gravel and a few minutes with the tractor, and we're all set for the next couple of year. One thing that you'll notice about these pictures is a distinct lack of cows. When we turn them loose on this pasture they pretty much make a beeline for the rear fence, and spend most of their time back there. It's peaceful and green and boring -- pretty much cow heaven. Yep, I've had some issues with cows on this property, but I've learned to keep the fence in good repair and it's meant pretty much trouble-free operation since then. In some places the grass is 8' tall. Have a happy summer, cows! We've got a litter of Airedale puppies that we're selling right now, and Andrea is handling that quite well. One of the people interested in a puppy came by, looked at all of the puppies, and ended up picking one. We asked for, and she paid a $100 deposit on the puppy, and we assumed that we'd see her in a couple of weeks when they were weaned. The deposit is a point at which we consider the puppy to be sold; we tell other people interested in purchasing it that it's not available for sale, and we hold the pup until the sale can be concluded by paying the balance due -- in this case, an additional $350. Andrea, because she's generally more than fair, agreed to return the deposit, and asked when the woman would be able to come get it. The woman said initially Friday, but emailed and said Saturday. And then blew off Saturday, but emailed and said that she'd be there FOR SURE on Sunday! So after the third time that this woman agreed to a day to come get her deposit and then blew it off, Andrea was pretty frustrated. I have reviewed all the email between Andrea and you related to the deposit. Thank you for your interest in our Airedales - when we take a deposit on a pup we tell other people that pup is sold and potentially loose sales because of that. I'll be letting everyone know you're running a scam. Hopefully nobody takes your advertisement seriously. Don't need the rest of the public to lose their money to people who never made it clear the deposit was non refundable and who care not about the hardships people are in. We take deposits on all of the animals we sell. It's become a standard part of our business, both to make sure that the sale is firm, and the buyer committed, and to allow us a small amount of insurance if the purchase does not go through. In the case of piglets and puppies, they sell best when very young. Do you think that we have treated this woman fairly? I spotted a bird today that I've never seen before in this area. It's a yellow-headed blackbird, Xanthocephalus xanthocephalus, and it's got the ugliest song I've heard for a long time. According to this website they're not known to be in this area. They're co-existing with the normal redwinged blackbirds we see all the time. There were about 10 of them, all happily picking through the compost for tasty bugs. I purchased a property at a tax foreclosure auction in December of 2011. I wrote about the initial purchase here, and then followed it up about a month later with an update where I talked about the financial situation here. I talked a bit about dealing with the former owners here, finally deciding to evict them, and then I wrote what I thought was a final update here, where I tallied up the costs. Today I got a pretty interesting call. I could not figure out why the bank didn't pay the back taxes (about $10k) to redeem the property from the auction. I couldn't figure it out. Turns out that the bank had turned over servicing of the mortgage of the property to a company, and it was this contracted company that probably dropped the ball, in my opinion. "Hi. you purchased a property at a tax auction in December of 2010, and I'm calling to inquire about the redemption figure for that property". "Well, I work for the servicing company, and we're interested in getting that property back and returning it to our contracted party. " Oh. You mean that the bank that used to hold the mortgage on this property is pretty darned pissed that they lost the property, and you're interested in paying me to get it back for them? Comparable units in this area are selling for $165k. My acquisition cost was around $103k. I've rented it for 6 months now for $1k a month. The island that I farm has a lot of soft ground. It's surrounded by a dike in the 1920s, but some of the ground inside the dike is peat bog, and every year or two someone sinks equipment in one of the bogs. The island has a harder crust on top of filling. It's a little like a piecrust, this land. If you break through the crust you fall into the filling -- and it's a long way to the bottom. When they drove the pilings for the local bridge they had to go 160 feet down to get to bedrock, so it's pretty safe to say that if it continues to sink, this equipment will be completely submerged. They're OK until the water reaches the bottom of the turret. The electronics are usually in the bottom of the turret, and when they get submerged, you have 44,000lbs of dead weight to deal with. So what do you do in that case? You rent a pump and keep the water down, and you clench your teeth and order replacement electronics for around $5k. You keep the water down long enough to install the new stuff, and your hoe runs again -- and then you're just stuck. Instead of being stuck and immobile. Bottom of Turret in water. Bad. The last one of these that got seriously stuck required a 50 ton crane, 2 300 series excavators, a cat D7 and 10 truckloads of matting to get out. I'm curious what these guys will do. I've offered them to use of my mats and timbers for free, provided they put them back when they're done with them. If you're curious about the location, you'll find a link to google maps here. They're harvesting the poplar plantation that you see in the link. I have a small flock of katahdin hair sheep (about 30 of them) and 8 wool sheep (suffolk sheep that don't shed their wool) on my farm. I'll be moving them to their summer pasture in a few days, so I scheduled in a sheep shearer (McElroy Shearing, 206-931-2869) to do part of the work. I have no connection to Mr. McElroy other than as a satisfied customer. For folks that come to the farm to do work, one of the valued commodities is that they show up on time, and he did. The setup was pretty simple. We put a piece of plywood across the end of the loading chute that's part of the corral. Once the sheep are in the cute, cut gates allow us to feed them through one at a time for easier processing. So in this go we: Trimmed the hooves, sheared, ear tagged, castrated, and checked condition of each and every sheep, and we also trimmed the hooves on the goat to keep the local animal control folks happy. It's part of the yearly grind of keeping sheep, but apparently passerby were concerned. and working all the way around it. until a clean edge that is level with the pad is exposed. No reaction from the sheep when you're doing this. Finished with one side, you move to the other part, and repeat. The hair sheep needed to be sheared, and at this time of year, they can look pretty mangy. Dreadlocks, sort of. At the rear of the sheep they're often poop locks. Starting with the belly a patch is shaved clear. And then the body, carefully positioning the sheep so that the shears can work. The sheeps body is under his knee. Its fleece -- the wool shorn from the sheep - is between his knee and us. Newly shorn, here's the same sheep. Looks like a new animal! The sheep aren't really thrilled with this who procedure, but they seem to tolerate it pretty well. This is pretty much all of the work that needs be done on the sheep until this fall sometime. They're all set to go to the new pasture. This is a pictorial followup to a post I wrote about losing a cow. So the fellow who owns this truck (and was apparently living in the trailer behind it) pulled his truck and trailer off the island the day after the accident. Given the age of the truck I'm guessing that it's totalled. No insurance. This is the spring litter of Airedale pups. We take them from the house each day and put them into one of the calf domes we've got at the farm., where they spend their day peering over the lip of the dome at the activities. They're pretty curious about everything. We've had 5 or 6 groups by to look at pups; they bring their dog sometimes, to see how it reacts to the pup, or their parents or friends. Picking a dog is a serious endeavor -- the more heads the better! They're still nursing off mom, but are eating an increasing amount of canned food each day, mixed with puppy chow. Each pup will polish off a half-pound of this mix. You'd think that a pup wouldn't be able to put that away, but these guys do. There's 11 in this litter, born the 2nd week of May, 2011. Driving across the Midwest I saw a lot of new grain storage bins -- see the shiny one on the left? -- they don't call them silos, they're bins. Nearly every farm had a new bin or two, and I saw lots of newly constructed bins. This is the other side of the ethanol issue -- corn ethanol is pretty popular in the corn belt. In Sioux City, Iowa they had sandbag filling stations. dump truck loads of sand, pallets of empty bags. The local radio stations were asking for volunteers to fill the bag. This parking lot flooded 3 days after this picture was taken. They've filled and placed millions of sandbags. It's a slow-motion flood -- the army corps of engineers is increasing the water flowing over the dams slowly because there's no more holding capacity behind them,and if they don't, they'll have failures. This means that the flood creeps up a few inches an hour... but it's still a flood. Lots of people being displaced, lots of crops ruined. This is a huge coal mine in eastern Montana. It's right next to (and actually goes under) I90. What most folks don't know is that we have a 200-250 year supply of coal in the USA. We could supply our entire energy production from our coal deposits for more than a hundred years. I don't think we'll ever have to worry about a lack of energy, but there are drawbacks to burning coal. Next to this coal mine is a huge electric generation plant, and this is the dirty little secret about electrical cars. 57% of all electricity generated in the USA is generated by burning coal. So we're taking oil burners off the road and replacing them with coal burners. You just don't see the coal burning -- but it's there. The more popular the electric cars, the more coal we'll consume. Maybe burning coal is better/cleaner than burning oil... but I view them as basically the same. Both are fossil fuels. We in the USA prefer our dirt to be out of site. So next time you see a prius going down the road (or a Chevy leaf, or a Tesla roadster) remember that it's not really an electrically powered vehicle -- it's coal fired! I am seeing more of these windmills (these are in south Dakota) and they're an extremely visible alternate energy. I think they're pretty cool. But while they're cool, right now we only produce 2% of our electricity with them. We are the 2nd largest windmill power producer in the world -- china is first. The estimate is that in 18 years we could be up to 20% of the USA electrical needs -- which means coal will still be #1 by quite a margin. Got a call that my Holsteins were out, and so drove down to the island to check on them. Sure enough, they were out, so I herded the slowly up the road, and then into the driveway. As I was moving my cows across the road in front of my place; one of them got hit by a guy speeding down the road. As is typical on my little island, the fellow immediately fled the scene. But when you hit a 1200lb steer at 45 mph, well, there's a trail of parts that makes it easy to find the house. The impact broke off the left rear leg of the steer. I put it down, and then skinned it and field dressed it on the road. Pouring rain, and pretty cold. Pretty good conditions for field dressing, actually. The road in front of my farm is posted at 25mph; this guy was going 45 or so. The cow got thrown 120' or so. What was interesting was that the pickup trucks front bumper wasn't touched; the impact was pretty much the engine, hood and windshield. The deputy who responded said it looked a lot like a moose impact -- which makes sense, as my $5 calfs are really huge now. The fellow had a suspended license, no insurance and apparently drank quite a bit of alcohol when he got home -- stress from the accident, I suppose. I'll look at the carcass tomorrow in the daylight to see what I can salvage. Picked up 4 nice stainless steel feeders for $80, 20 of the automatic waterers I want, and while I was at it picked up a few hitchhikers. They're bluebutt pigs; a cross between a hampshire and a yorkshire. They're mostly pink with faint hampshire markings, as you can see in the above photo. My first pigs were bluebutts, and my experience with the breed has been good. Large, sturdy pigs that are pretty docile. The pig hauling rig worked pretty well, but I'm finding that the trailer needs some work; probably have to replace the brakes and do some fixes. The gates between the compartments aren't pig-tight; small pigs can cram themselves between the bars, and slightly bigger pigs can get their heads wedged into the gates. The doors aren't split, either, which means that if you're working with the top level, the bottom level is open, too. I'll probably split the man door to allow individual compartment access, but I'll leave the rear door solid. I will add a grate on pins so that the back door can be opened but the pigs contained inside. It was an interesting road trip overall. Raising pigs in washington: Equipment roadtrips, hutterite colony. Well, I'm going to say it. There's really no commercial pig activity outside of hutterite colonies in Washington State, and there's certainly no dealers for common hog equipment. Virtually everything I need I end up having to have shipped in from Iowa or other parts of the midwest. Speaking of Hutterites, I recently toured one of their colonies, and I have to say, I have never, ever seen as much top-of-the-line farming equipment as I did there. Nor have I met a group of people who work the number of hours that the hutterites do. I had heard of Hutterites in passing, but nothing in detail. Having talked to them, and thought about it, I'm convinced that Hutterites provide serious competition for any agricultural endeavor that they set their mind to. The colony that I toured was just about to start production of coho salmon... in ponds in the middle of MONTANA, which struck me as... well, unexpected! What's funny is that you can find all sorts of hog equipment, and in fact, very good quality hog equipment, all over the midwest. Stainless steel feeders, gates, pens, management tools... most everything a small hog farmer needs can be found there. So I'm on a roadtrip for the next few days; I'm driving to Iowa to pick up a load of various things I'll need for my farm. I'll see if I can't write something about the trip as I go. I'm driving I90 from Seattle to Iowa and then back. 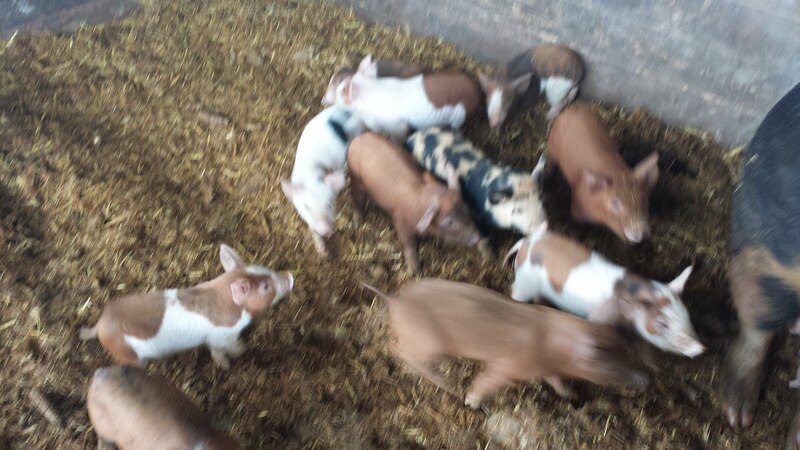 On a commercial note, I've got 30 pigs that are due to be weaned next week, around June 9th. If you're in western washington and want a weaner pig, email me and I'll set you up. They're $95 each, quantity 1-4. My pigs are pretty used to a temperate climate; we don't get very hot, or very cold. Most of the year I'd guess we're at 40 degrees, so when it gets above 50, the pigs act like they're in a sauna. My fields have various types of soils in them, and what the pigs like the best is this light grey mud. It's a very fine silt, and feels like oil in your hands. I think that the pigs love the feeling because they seek it out; the black boar is in the favorite mud wallow, and because he's pretty high status, he's in there alone. When he's done, other pigs will move in. He probably weighs 500lbs. Stripe has decided she doesn't want to wait, and is out wading in this wallow. She's a medium sized sow, maybe 400, really a sweet girl. Nice Hampshire markings on her, too. Hampshire are all black with a white strip across the shoulders. Her stripe is wider than most, hence her name. The pigs that it can't get too hot for are the piglets. The LOVE it when its hot. They don't have much insulating fat, and they're pretty skinny (read lots of surface area for mass) and no matter how hot it gets you'll find them out laying in the sun, soaking up as much of it as they can get. They're very fast and active at this age; about a week old.